Recently my brother Drew and I, headed across the pond to pay a visit to the Vispring factory. 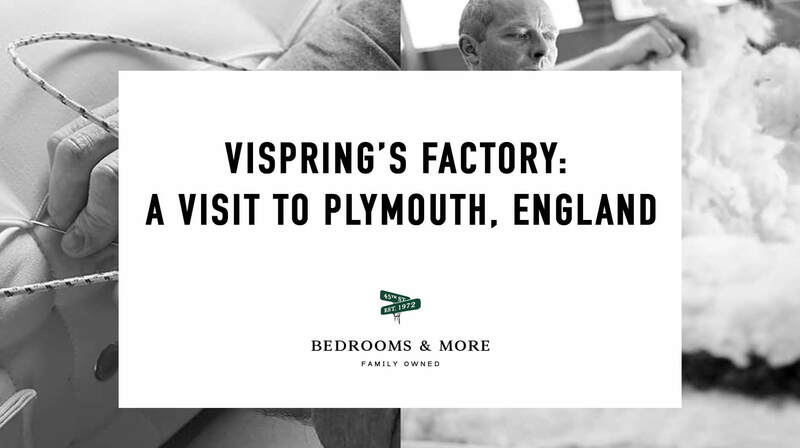 Nestled in the quaint, historic town of Plymouth, England, Vispring‘s mattress factory is abuzz. Machinery whirs, while skilled craftsmen and women meticulously craft some of the best beds in the world. It was an amazing experience. I have visited an awful lot of mattress factories in my lifetime, but nothing comes close to what I saw in Plymouth. Just walking into the factory is inspiring. Images from decades before adorn the halls as you make your way to the factory floor. Photographs from generations of owners and workers alike show that this is not just a place where they turn out product; they are supporting lives. Coils, coils and more coils. There are more than a dozen machines churning out calico cotton covered coils of various gauges. Machines from a bygone era hum along like the day they were built. One coil at a time, each machine pumps back and forth, up and down. Steel is unwound and sleeved from a massive spool six little turns at a time, . All the coiling machines feel massive hoppers filled with a particular gauge and height coil. Once a mattress is scheduled to be built, the coils from that hopper, which look like a long string of calico covered pearls, are assembled on a table by hand. Three separate craftsman lay coils on a table and sew them together by hand. Cutting and sewing is all done on site. Quilted cotton and wool side panels are made to order. A handful of workers meticulously tuft side panels to coil systems. The magicians of the factory floor are the side-tufters. In 20 minutes, each worker can tuft a single row of stitches around the perimeter of a mattress. Every mattress has 2 to 6 rows of side tufts. Each mattress has a different formula. None of the mattresses contain foam. Mattress artists lay horsehair, cotton, wool, silk, mohair, alpaca, and other fibers in batts, or blended together on top and bottom of the coils. A worker stretches an embroidered fabric panel tightly across the batting. They repeat the process for the opposing side. A fabric tape edge keeps the mattress together. This looked like the most physical job on the factory floor. A single man pulls all the materials together on the corners of the mattress while running a machine around a spinning table. It seemed like a job for 3 or 4 people. He then flipped the mattress and repeated the process. Now the bed was ready to tuft. This portion of the process was a team effort. A machine compressed mattress stands vertically. One at a time, workers insert more than a dozen tufts. First they insert a long hooked needle through the mattress. One of them places a heavy thread and tuft. The worker who inserted the needle pulls the thread back though the mattress and adds a second tuft. The mattress out of the machine, which had been 2 feet thick is now 9-11″. Tufting pre-compresses all of the materials inside. Calling it a box would diminish the craftsmen and women who build them. Mattresses and divans have the same kind of coils. A solid wood foundation supports the coils. Fibers, fabric and tufting are done in the same way as the mattresses. Some of the divans have drawers built in. Even the drawer faces have fabric upholstery. In my 38 years, I have never seen craftspeople like this. I would eat off the floor of this factory it was so clean. The beds will last a lifetime. No one cares more about product than me, but these people are right there. This entry was posted in Featured Posts, History, Luxury Mattress, Two Sided Mattresses and tagged factory, travel, Vispring.